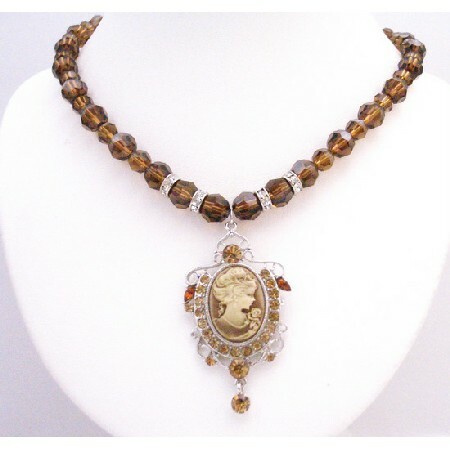 Harmonious accumulation of Round 8mm & 10mm Smoked Topaz crystals round the necklace with Dangling stunning cameo pendant. This is such a Beautiful Lady cameo Pendant Smoked Topaz Crystals the vermil Round Crystals necklace Dangling Pendant Embedded Smoked Topaz Crystals. The pendant is adorned by sparkling Smoked Topaz Crystal Excellent quality. Perfect with any outfit Superr Grade RARE HIGHEST QUALITY. Good shinning surface quality with unique attractiveness & fashionable flair to this stylish. What is in this season? Check this out! Necklace a trendy piece with beautiful Cameo Lady Pendant Necklace a perfect piece for anyone to wear for a formal or casual occasion!.